One of the things I have enjoyed from Beyond Here is the connection to other photographers around the world. Today’s post comes from guest poster Ishita Gupta. Ishita is based in India and is in the process of establishing her photography business focusing on baby and kids photography. 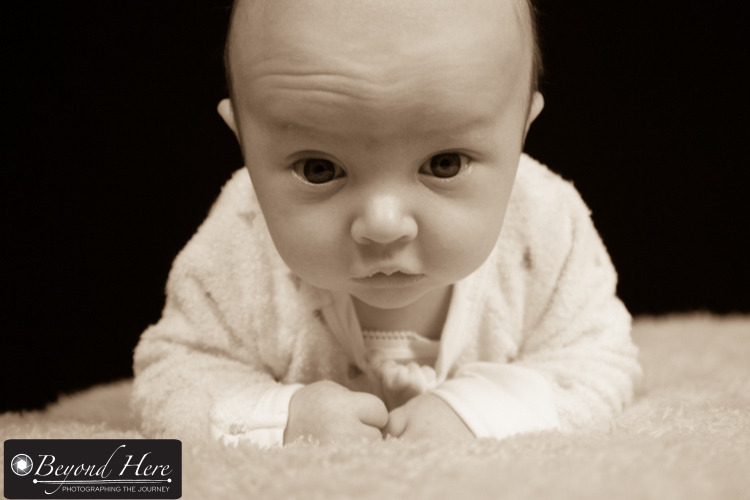 Please see her website here, and read on for her tips for photographing babies. When you have a baby at your home, all you do is click lots of pictures and take videos. You love to save all their moments with you let it be the first step, the first birthday, the first smile, the first grin etc. Here are some Tips for Photographing Babies to take the best shots and cherish them forever. We cannot predict babies so, therefore, keep clicking rather than waiting for that perfect pose or moment because somewhere in 20-30 consecutive shots there will be one perfect shot. When capturing babies, you may need to “engage with them” to elicit a reaction. This can be playing peek-a-boo, making funny faces, or making funny noises etc. There are so many ways you can get a baby to smile. To take memorable pictures try to capture the baby with family and friends. Siblings, especially if they are close in age make a perfect happy photograph – get them playing, eating, interacting together. Let the kids do what they want to. Take the photos from a distance, so as not to disrupt them. You get better shots if you try different angles in each pose. You never know when you get a great photo by varying your angles. There are many tips on photographing babies, but the most important is to be Natural and fast. Baby’s age is an important factor while shooting as the poses will depend on how comfortable they are. Though every baby is different, generally, the age of the baby can dictate how the session will run. Little babies can more easily take curly positions than older ones. I strongly encourage parents and photographers to schedule sessions when babies are under 2 weeks of age. At this age babies stay asleep longer, are easy to position in curl up poses, and usually have their feeding time set. There are parents who want take a session with their baby who is older than 2 weeks. When you have a session with an older baby, you’ll need to focus more on the props of the baby, awake/slept, dresses, bucket or handheld shots. It might not be easier to position them in curly poses. Some parents are interested in cute/creative photos of their baby so that is when props are important. No Matter What. Baby Should be Safe! Baby Photographer is one of the best and cutest jobs in the world and for you, baby safety should always be number one priority. Everything you use for the shoot, including bucket poses, clothes, and even prop shots should all be done with safety in mind. Babies are very quick in their reflexes, and instantly they can roll over. Don’t take chances; be safe! Keep a close distance between you and the baby at all times. You should sanitize your hands as well as props constantly. Baby should never be left unattended. Thank you Ishita for your guest post for Beyond Here. You are the first guest poster from India, so that is something worth celebrating! We wish you well as you start your business. Thanks again for contributing Tips for Photographing Babies, and welcome to the Beyond Here community. This entry was posted in Guest Posts, Photography Tips and tagged baby photography, baby photography tips, family photography on June 22, 2018 by Craig Dingle.